Many are familiar with this cheerful, diminutive forest creeper (Gaultheria procumbens); it’s often one of the few wild plants the average contemporary northeasterner can identify. 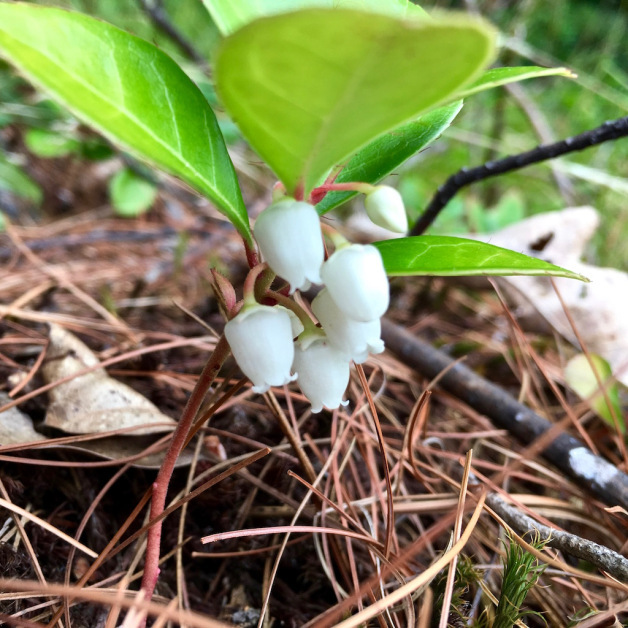 I grew up knowing this tiny relative, taught by my grandparents about its wonderful aroma as we picked a leaf or a berry to chew on while we walked in the pine barrens and oak scrub of eastern Long Island (NY). That it was growing under pine and oak is a good reminder of its preference for acidic soils. 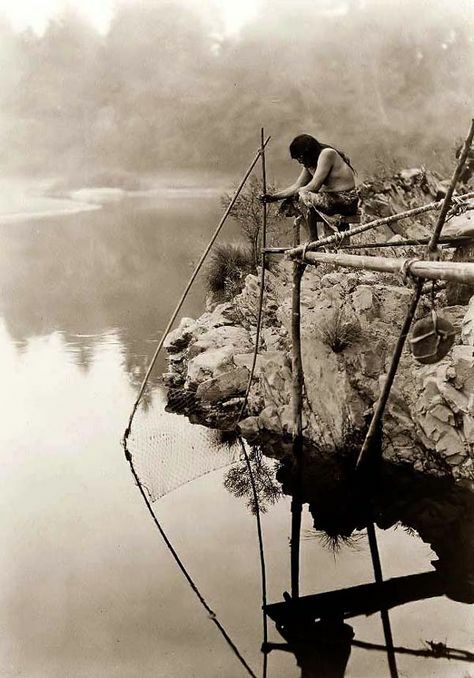 It is a readily encountered neighbor here in Sokwakik as well, in the hills above the Kwenitekw under similar conditions. 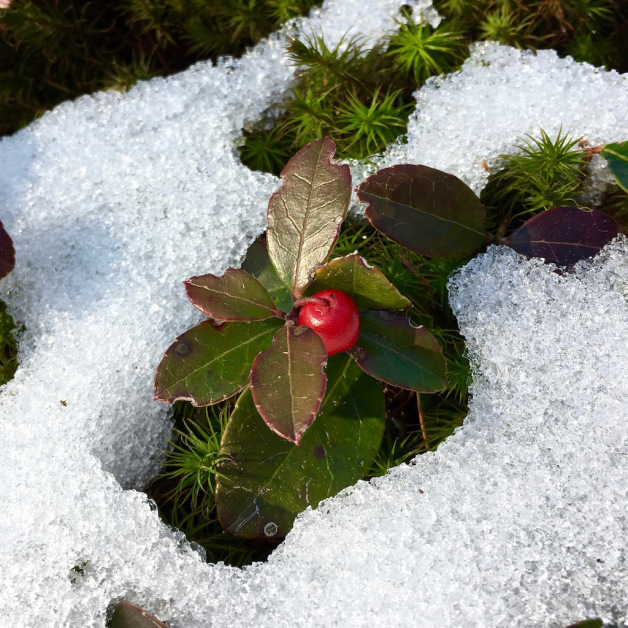 The name wintergreen is easily understood: the shiny, leathery leaves are evergreen year-round and it also holds its berries through the snow. 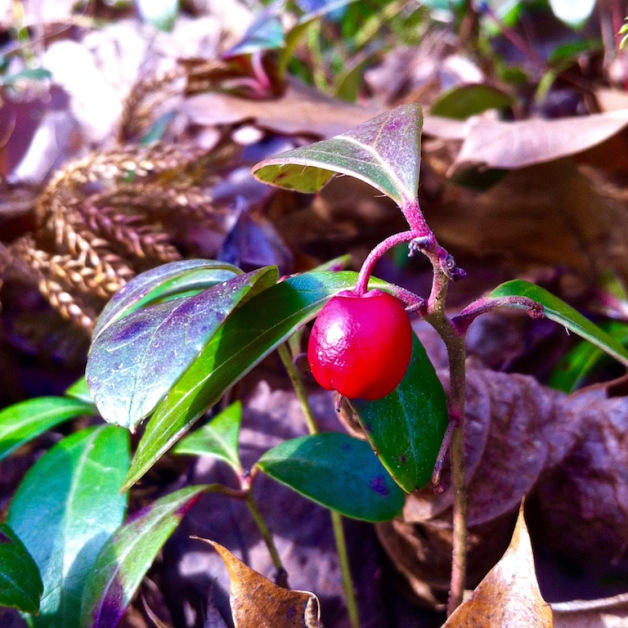 Though a little dry, the berries have the same eponymous “oil of wintergreen” flavor as the leaves. The scent of this essential oil is primarily due to methyl salicylate, which metabolizes to salicylic acid, a common non-steroidal anti-inflammatory drug (NSAID). This is the same compound derived from aspirin, which is acetylsalicylic acid. As a medicinal tea, it is best known for pain relief – an analgesic for rheumatic symptoms, headache, fever, sore throat, and various aches and pains, along with treating kidney ailments and as a blood tonic. Otherwise, leaves are used traditionally for tea as a beverage and for flavoring in cooking. The berries are, of course, an edible nibble food much of the year. Other common names are: teaberry, for the above reasons, and also the source of the name of Clarke’s Teaberry chewing gum – another fond childhood memory associated with my grandparents; checkerberry, for the red fruit’s fancied resemblance to that of the Old World chequer tree (Sorbus torminalis), but the resemblance ends there; partridgeberry, a common name I prefer to use for Mitchella repens, which is often found in damp sites under conifers – often hemlock; and boxberry, which seems to be provoked by another awkward fancied resemblance to the European Box tree (Buxus sempervirens), which has evergreen leaves in a somewhat similar shape, but again, the resemblance ends there. The urn-shaped, downturned flowers of waxy white (sometimes pinkish) appear pendant below the leaves in June or July and mature into bright red berries (10 mm) in late summer or autumn. Often it is the berries that catch one’s eyes first. While an extensive spread of wintergreen may appear to be a collective of happily cohabiting individuals, the colony may actually be a clonal extension of a single plant, spreading by shallow rhizomes beneath the forest duff. Also, these short (5-20 cm) clumping plants are classified as a sub-shrub similar to many other members of the heath family, and not as a tender herb, due to the woody nature of the lower stems. 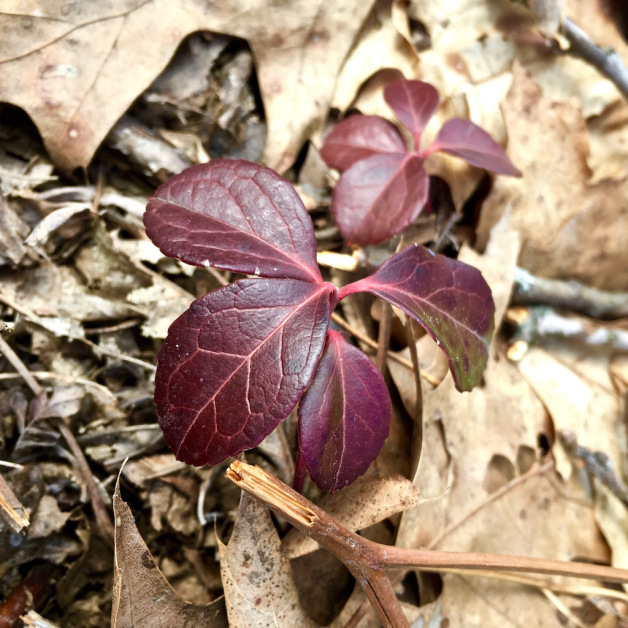 Not all wintergreen is found under the forest canopy; they may also be found out in the open if the soil is acidic enough, and may turn a deep wine red (pigments known as anthocyanins) as a protective measure against strong sunlight. Here, “g8g8g-” means sawtoothed or dentate, describing the leaf margin; “-owi-” creates an adverbial form, in the sawtooth way; and “-bagw” describes a leaf, and a plant by extension. And indeed the leaf is sawtoothed, although very subtly (see photos above); each marginal tooth actually has a very small hair or spine, which may suggest the root “g8wi-” also, which signifies a thorn, or pricker, or quill (as with a porcupine). Interestingly, the Penobscot name for wintergreen is kαkάkəwipakʷ which is raven[berry]plant, from kάkαko – the word for raven. The inspiration here is that the berries serve as food for the ravens, who are also frequenting the pine-covered mountainsides. 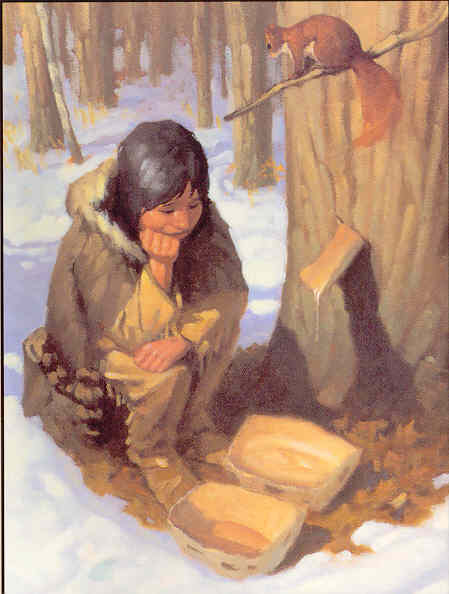 Thus, the words for wintergreen in the two closely related languages (Western and Eastern Abenaki/Penobscot) are near-homophones, but with 2 different points of origin. It is thought the raven’s name is onomatopoetic, simulating its call. It is interesting that the raven also has a sawtoothed ruff of feathers at its throat. Other languages assign ravenberry to a different plant, red bearberry being one. There are many different trails to arrive at a destination. From the Brattleboro Words Project website, at the bottom of the Harris Hill site-specific page (scroll down)… An audio track contributed to the multiple layers at this place. Much has been seen here, in the thousands of years it has been a dwelling place; beneath the feet of the ski jump visitors lies a long line of stories. 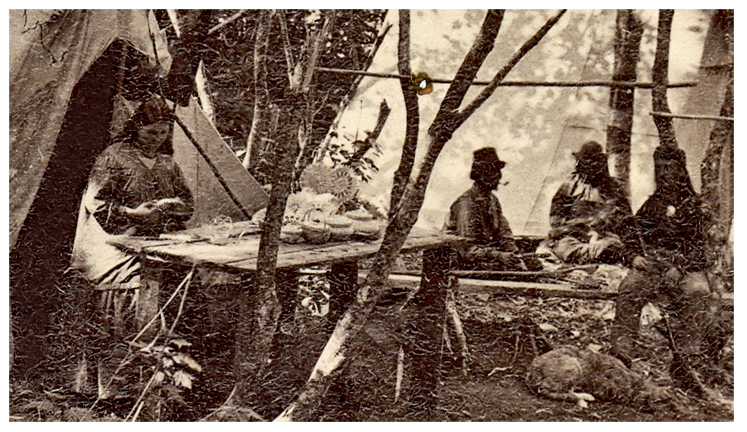 Podcast here: The Gipsy Ground by Rich Holschuh. Produced by Reggie Martell. Much more info here, at another Sokoki Sojourn post. 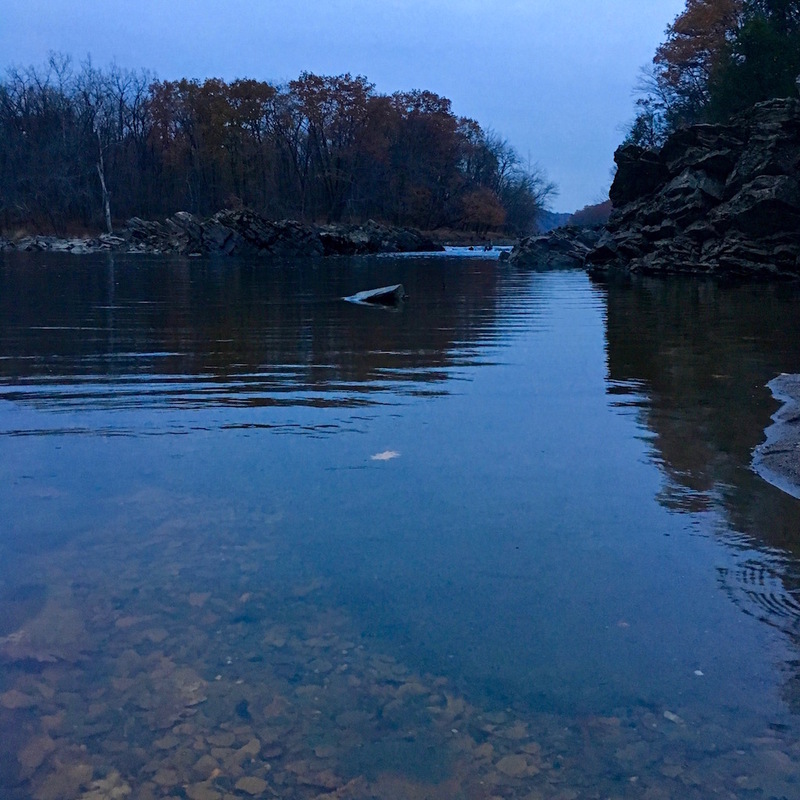 Iron-oxidizing bacteria feed on dissolved ferrous solutions in groundwater at the point where it emerges back into the atmosphere. 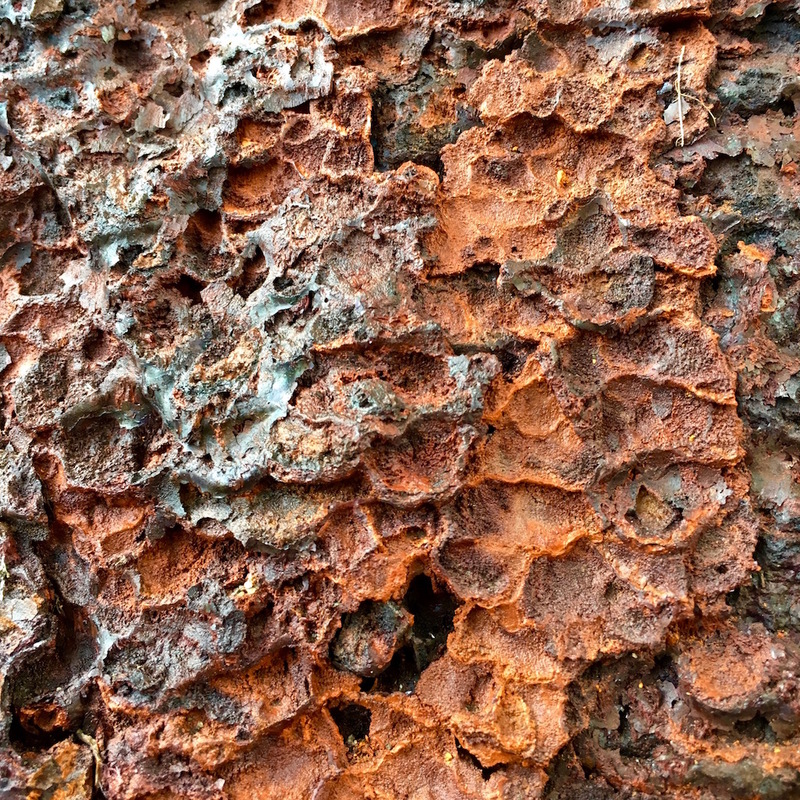 There it may form deposits of ferrous oxide which can be collected and converted into yellow or red ochre pigments. 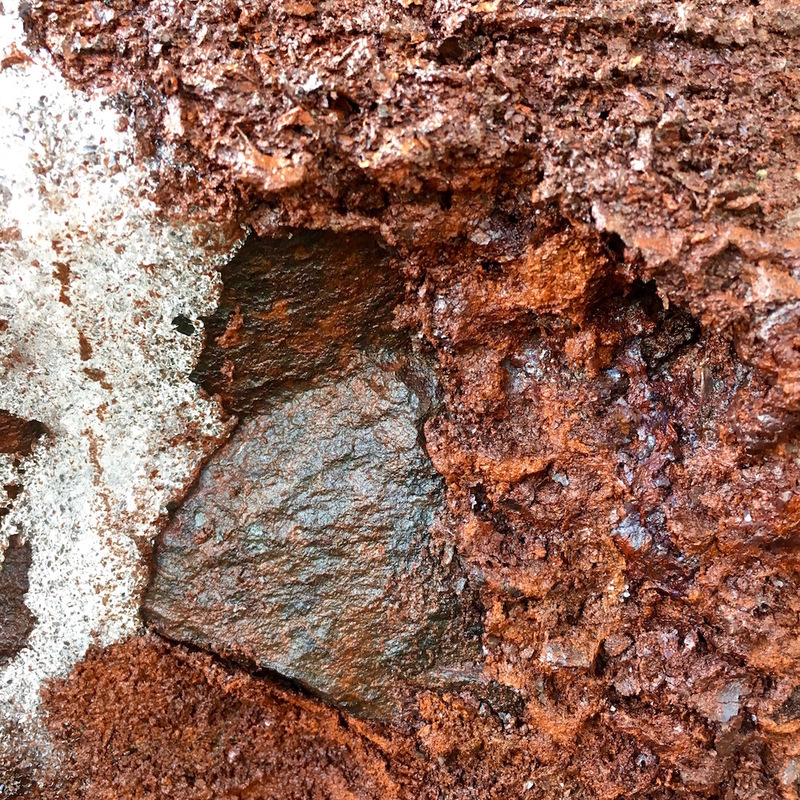 This is also a historical source of what is known as bog iron. These pigments are an important resource for many indigenous cultures, including the Wabanakiak. 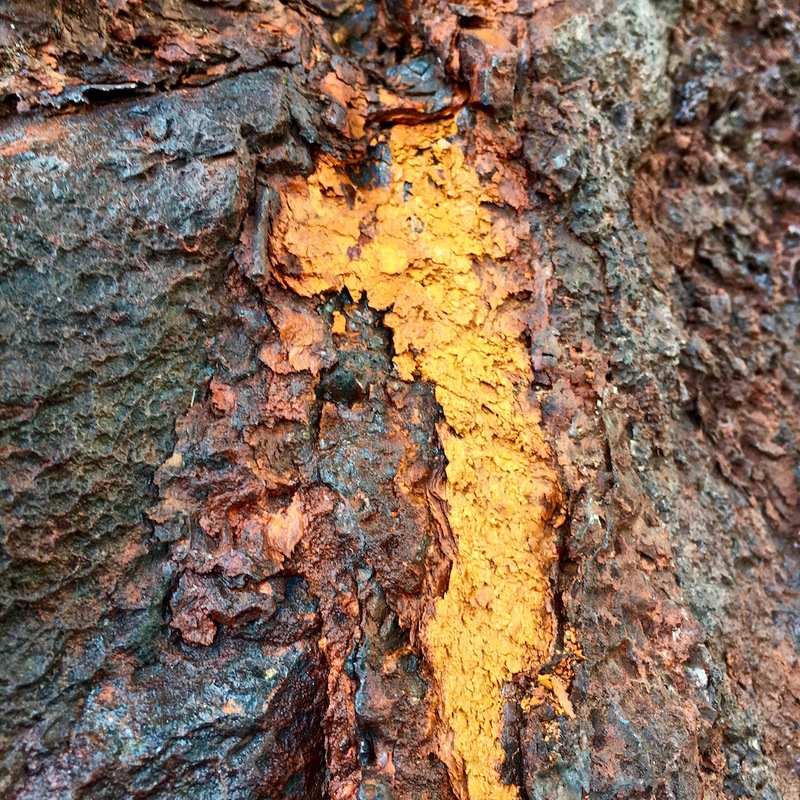 Ochre is a strong, persistent pigment that can last for thousands of years and has many practical and ceremonial uses. At times, the trickling iron-rich water will create intricate, organic cell-like patterns on rock or soil as the molecules aggregate. Sometimes it’s just a rainbow shimmer on the water surface.